7 Books That Go Bad. Really Bad. If there’s one thing you learn from the movies, books can sometimes cause a heck of a lot of trouble. Read and write responsibly. But sometimes books make bad things happen. Looks harmless, right? The Book of the Dead, along with an audiotape of incantations from said book, create all manner of demonic problems for Ash and friends in their remote cabin in the woods where they’re stranded. Evelyn (Rachel Weisz) can’t resist a good read of the Book of the Dead which brings life into the mummified remains of Imhotep who was, until recently, decaying in his tomb, minding his own business. With him he brings several plagues and many more deaths in an attempt to raise the body of his old girlfriend. Well done Evelyn, well done. 3. Se7en – Divine Comedy, Canterbury Tales and more. A killer takes inspiration from his local well-stocked library (support your library) and goes about murdering people in the style of the Seven Deadly Sins (this is an incorrect use of library books) while Detective Mills (Brad Pitt) and Detective Somerset (Morgan Freeman) pursue him. It’s not pleasant. What’s so bad: Poor old Ginny just wanted somewhere to write all her inner most thoughts. Unfortunately, she picked one of Lord Voldermort’s horcruxes and became a vessel that term for all Tom Riddle’s evil doings, including unleashing a massive basilisk. How to survive: You need a Weasley, a phoenix and a Basilisk fang… Or maybe you just don’t write in other people’s diaries. All Jack wanted was a bit of peace to write his novel. Unfortunately he picked a haunted hotel. And things take a turn for the homicidal. How to survive: Be really, really good at mazes. 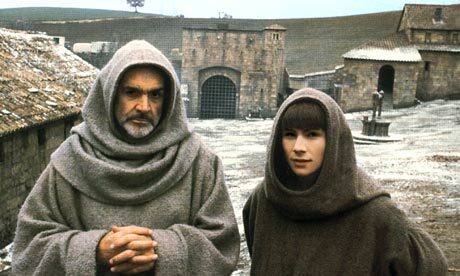 There’s a spate of mysterious deaths at a Benedictine monastery and William of Baskerville (Sean Connery) sets about investigating. Upon discovering a secret library, William and his novice (Christian Slater with alarming hair) find that all the victims have read the same book before they died. How to survive: Fire and peasant uprisings should do the trick, but try and save the books. A group of teens head to a deserted cabin for a party but they are being manipulated and watched from an underground facility. When Dana (Kristin Connolly) reads from an old diary that she finds in the cellar (against excellent advice from her friends), all hell breaks loose! How to survive: I guess having a good friend helps.